Easy answers to the numerous problems posed by the proliferation of nuclear weapons will not be found in Paul Bracken’s The Second Nuclear Age: Strategy, Danger, and the New Power Politics. In fact, Bracken has very little to say about what are often considered to be the perennial nuclear issues of the post-Cold War world. How should America, Western Europe and Israel deal with the problem of Iran’s quest for nuclear weapons? Will the nuclear rivalry between Pakistan and India become as stable as the rivalry between the United States and the Soviet Union eventually became? What countries are likely to pursue and/or acquire nuclear weapons in the coming decades? How can the nuclear proliferation regime be strengthened and extended into the twenty-first century? Paul Bracken. The Second Nuclear Age: Strategy, Danger, and the New Power Politics. New York: Times Books, 2012. ISBN: 9780805094305 (hardcover, $29.00); 9781250037350 (paperback, $16.99). Readers looking for clear and simple answers to these questions may become frustrated with The Second Nuclear Age. Dismissing Bracken’s book because it does not offer simple solutions to these questions, however, would be a mistake. His central purpose, like many of the great nuclear strategists of the 1950’s and 1960’s, is to challenge scholars and policymakers to rethink the common wisdom surrounding strategy in a multipolar nuclear order. The reality of the second nuclear era is that the great power monopoly of nuclear weapons is over and it is highly unlikely to ever return. Bracken argues that after the Cold War, policymakers in the United States went on a “strategic holiday when it came to thinking about nuclear weapons—that is, any thinking that went beyond the narrow confines of non-proliferation or disarmament ” (5). The beginning of wisdom about nuclear weapons in the twenty-first century, Bracken argues, is acceptance of the fact that nuclear weapons are here to stay and that the key task for policymakers is to manage the dangers of a multipolar nuclear era and understand “the dangers, instabilities, and dynamics of international relations in the new nuclear context” (4). Not surprisingly, neither of the roundtable reviewers is completely persuaded by Bracken’s analysis of the second nuclear era. S. Paul Kapur thinks that Bracken is correct to emphasize that the most important danger of the new era is the possibility that smaller crises between regional nuclear powers will escalate in uncontrollable ways. He also agrees with Bracken that U.S. policymakers are unlikely to convince actual and potential proliferators that nuclear weapons have little or no political utility. However, Kapur is far from convinced that the analytical distinction between the first and second nuclear ages is as distinct as Bracken suggests. It is for this reason, Kapur argues, that many of Bracken’s policy prescriptions for the second nuclear age bear more than a passing resemblance to the ones employed during the first nuclear age. Unfortunately, the author declined to submit a response to the reviewers. Paul Kapur is a professor in the Department of National Security Affairs at the Naval Postgraduate School. His research and teaching interests include nuclear weapons proliferation, deterrence, ethno-religious violence, and the international security environment in South Asia. Kapur is author of Dangerous Deterrent: Nuclear Weapons Proliferation and Conflict in South Asia (Stanford University Press, 2007); and, with Sumit Ganguly, India, Pakistan, and the Bomb: Debating Nuclear Stability in South Asia (Columbia University Press, 2010). Joshua Rovner is the John Goodwin Tower Distinguished Professor of International Politics and National Security, Associate Professor of Political Science, and Director of Studies at the Tower Center for Political Studies at Southern Methodist University. Before coming to SMU, he was Associate Professor of Strategy and Policy at the Naval War College, and he also taught at Columbia University and Williams College. His book, Fixing the Facts: National Security and the Politics of Intelligence (Cornell University Press, 2011), won the International Studies Association Best Book Award for security studies, and the Edgar S. Furniss Book Award, presented by the Mershon Center at Ohio State University. 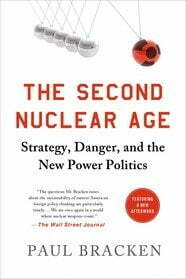 In The Second Nuclear Age: Strategy, Danger, and the New Power Politics, Paul Bracken argues that the world has entered a new nuclear era. This second nuclear era will differ significantly from the first, which stretched from the bombing of Hiroshima and Nagasaki in 1945 to the end of the Cold War. In contrast to the bipolarity of the first nuclear age, the new era will be multipolar, with threats emanating from diverse regional conflicts. The antagonists in these conflicts may have beliefs, preferences, and appetites for risk that differ significantly from those of the United States , making compromise difficult and conflict likely. Proliferating states in the new nuclear age will fear international efforts to thwart their quest for nuclear weapons. As a result, they will obsessively guard their secrecy, thereby reducing transparency and impeding international efforts to detect and prevent destabilizing behavior. And a plethora of emerging technologies will drive the formulation of strategy in the new era. Thus states’ strategic postures in the second nuclear age may more effectively promote the production and deployment of new weapons and platforms than advance states’ substantive security goals. The second nuclear age, then, is replete with danger, and will require the adoption of innovative policies suited to a changed strategic environment. The book contains many nuggets of valuable insight, stemming both from the author’s academic research and from his real-world experience in the policy arena. Bracken is particularly persuasive, however, regarding three main points. The first addresses the nature of the danger that nuclear proliferation is likely to pose in the second nuclear age. Bracken rightly points out that proliferation’s greatest threat will not be bolt-from-the-blue attacks by newly nuclear states. Despite popular fears, such attacks were extremely unlikely even at the height of the Cold War. Even allowing for higher levels of antagonism and risk acceptance amongst future proliferators, the possibility of sudden nuclear attack will remain remote. The far greater danger, as Bracken argues, is that low-level crises between nuclear-armed antagonists will escalate in unforeseen and uncontrollable ways, leading to nuclear confrontations that neither side initially wanted or expected. As I have argued elsewhere, this is especially likely because nuclear weapons can embolden newly nuclear states, leading them to challenge adversaries more aggressively than they would if armed solely with conventional weapons. Such behavior increases the likelihood of crises and the danger of unforeseen escalation. Nuclear proliferation could lead to nuclear conflict in the second nuclear age, then, not because irrational proliferators will launch suicidal attacks on their adversaries. The danger, rather, is that proliferating states may behave in a risky manner, triggering low-level crises that, despite efforts to control them, escalate catastrophically. Bracken makes a second convincing point regarding the likely geography of future nuclear conflict. As he argues, nuclear confrontation between the United States and Russia, or any of the Permanent Five- United Nations Security Council powers, has become exceedingly unlikely. Instead, nuclear conflict is most likely to erupt in the context of ongoing security competitions between regional powers, such as India and Pakistan or the two Koreas. Pathologies such as longstanding territorial disputes, religious intolerance, and extreme nationalism often plague these states’ relationships. As a result, they may not formulate nuclear policy in the generally risk-averse, technocratic, security-seeking manner of the superpowers during the Cold War. Rather, Bracken maintains, their leaders may be relatively risk-acceptant, beholden to public passions and prejudices, and dissatisfied with the status quo. The security policies and nuclear postures that they adopt may therefore be especially prone to triggering crisis and conflict. Given today’s tight cross-regional economic, political, and technical integration, these conflicts will harm not only the antagonists and their immediate neighbors; they will have extremely damaging system-wide consequences. Bracken’s third convincing point is both extremely important and sometimes forgotten in academic and policy circles: Nuclear weapons remain valuable political and strategic tools. As Bracken points out, elites in the United States and other nuclear powers have increasingly come to view their nuclear arsenals as undesirable and perhaps even obsolete. Moreover, they believe that through argument and example, they can convince newer or potential nuclear powers to adopt similar views and abandon or curtail their nuclear programs. This was a central purpose of the Obama Administration’s 2010 Nuclear Posture Review (NPR). Bracken makes clear that such an outcome is highly unlikely. Nuclear weapons will continue to matter. They can have significant coercive utility, helping states to protect themselves against powerful adversaries and potentially to challenge undesirable political or territorial arrangements. And they are prestigious, particularly for states anxious to shed the stigma of “third-world” status and emerge as influential international players. This is the reason why, in numerous cases, the NPR fell on deaf ears. Many states simply do not care whether the United States believes that nuclear weapons are useful. They find nuclear weapons to be strategically and politically useful. Consequently, these states are not going to give up nuclear weapons or abandon their quest to acquire them. Policies to deal with the dangers of nuclear proliferation should start not with sermonizing or wishful thinking regarding nuclear weapons’ lack of utility, but with a clearheaded understanding of this reality. Bracken’s arguments regarding the nature of the threat that nuclear proliferation will pose in the new nuclear era, the likely geography of future nuclearized conflict, and the continuing strategic and political utility of nuclear weapons, are thus extremely persuasive. Some aspects of the book, however, are less convincing. For example, it is not clear how novel the problems of the second nuclear age actually are. Some of the challenges that they pose may prove to be especially acute in the years ahead. But, in truth, many of these issues have been with us since well before the dawn of the second nuclear era. For example, states have always been obsessed with secrecy, shrouding their military plans and capabilities beneath layers of opacity and deception. This was true not only during the first nuclear age – it has been the case since the beginning of warfare. It would hardly be surprising if, during the second nuclear age, proliferating states also sought to hide their plans and capabilities from potential adversaries. Similarly, technology, and the bureaucratic interests of the organizations that develop and deploy it, has long affected the formulation of states’ security strategies, sometimes to the detriment of national-level goals. Finally, regional conflicts were dangerous and destabilizing well before the dawn of the second nuclear age; Vietnam, Korea, and World War I offer just a few examples. And Cold-War regional conflicts often had strong nuclear overtones, as in the case of the Arab-Israeli wars. It is also worth noting that the behavior of regional nuclear powers in the second nuclear age has not been altogether new. For example, as during the Cold War, we find nuclear states with relatively strong conventional capabilities, like India, pledging not to use nuclear weapons first. And we find nuclear states with relatively weak conventional capabilities, like Pakistan, seeking to shield themselves against conventional attack by threatening nuclear first use. The antagonists in today’s nuclearized conflicts, then, may be new. But the logic that underlies their nuclear behavior in many cases is not. The book’s second problem is that Bracken’s position regarding the utility of nuclear weapons is not entirely consistent. As noted above, he argues forcefully that rational states will find nuclear weapons to be useful tools in their attempts to gain coercive leverage over adversaries and to enhance their domestic and international prestige. Yet Bracken’s discussions of states that use nuclear weapons in this manner often characterize their behavior as inexplicable or even ridiculous. For example, he calls Pakistan’s use of Islamist terrorists against India, which has been facilitated by its nuclear capability, “irrational,” and suggests that the continued pursuit of such a strategy would be “crazy.” (75)Similarly, he labels North Korea’s Koreas use of nuclear weapons to deter potential U.S. and South Korean attacks, and to extort food and energy aid from the international community, “crazy,” the product of “transcendent madness.” North Korea is, in Bracken’s words, nothing more than a “starving rat” with “nuclear teeth.” (191, 192)Pakistan and North Korea’s policies are no doubt dangerous and undesirable. But they are not crazy, mad, or irrational. Indeed, they are rooted in the very logic that Bracken recognizes make nuclear weapons valuable strategic and political tools. Finally, despite his description of the second nuclear age as being rife with novel problems, the policies that Bracken proposes are surprisingly old-fashioned. For example, Bracken advocates continuing the Nuclear Nonproliferation Treaty regime; renewing arms control efforts; promulgating no-first-use doctrines; and using deterrent threats to prevent mass-casualty nuclear attacks. These are all perfectly sensible approaches to the problem of nuclear proliferation. But the close resemblance between Bracken’s policy prescriptions for the second nuclear age, and policies proposed or employed during the first nuclear era, is striking. And it indicates once again that the second nuclear age may not be as different from the first as Bracken often suggests. To an important extent, however, this reminder of continuity is the strength of the book. The Second Nuclear Age is valuable not because it reveals the existence of a wholly new nuclear world. It is useful, rather, because it reemphasizes enduring strategic truths. The players in the second nuclear age have changed, and the relative importance of some of the problems that they will face has shifted, but many of the same core strategic principles remain operative. An awareness of those strategic principles helped the world to get through the Cold War and they will, with some modifications, be useful in the new nuclear era as well. As Bracken argues, if the international community attempts to go on a “strategic holiday” during the second nuclear age, allowing itself to forget these principles, or trying to wish them away, it does so at its own peril. The United States never used a nuclear weapon in anger during the Cold War, but it invested a huge amount of time and money in its arsenal. American strategists also proposed a number of ways to use nuclear weapons for the purpose of political coercion, but testing these propositions was difficult. One reason was the sheer lack of historical evidence to go by: it is inherently hard to measure the coercive power of something that was only used in one conflict. Making matters worse, U.S. adversaries were authoritarian states whose leaders were difficult to assess. Understanding the prospects for coercion required fine-grained knowledge of how foreign leaders responded to nuclear threats, but intelligence agencies trying to gather that knowledge were frustrated by layers of security around leaders in Moscow and Beijing. In any case, it was not clear that anyone would believe threats of annihilation over political disputes that were less than existential. The result was peculiar. U.S. leaders found themselves in possession of weapons of extraordinary destructiveness, but they did not know if they could translate all of that military power into any kind of political leverage. In the absence of history, analysts turned to abstraction. Econometric modeling and game theory produced some notion of how states might use nuclear weapons to compel their rivals, and how those rivals might logically respond. Critics took issue with these approaches, however, in part because they assumed rational decision-making and downplayed psychological stresses that would inevitably affect judgment in a nuclear crisis. Critics also argued that abstract models ignored cultural and social differences among states with nuclear weapons. These differences might affect how those states thought about costs and risks, and thus what they might believe about the utility of nuclear war and how they might behave in nuclear confrontations. One way to overcome cultural myopia and wishful thinking was through crisis simulations and war games. The organizers of such exercises could bring in area specialists to play the roles of foreign leaders. Presumably their deep historical and political understanding would make them reliable stand-ins; at a minimum their presence would guard against naïve beliefs about how foreign leaders would respond to U.S. signals. Organizers could test the limits of rationality by deliberately injecting stress into the game, introducing unexpected twists, and forcing participants to work long hours and deal with physical and psychological exhaustion. They could also guard against overconfidence in command and control by forcing participants to deal with the kind of organizational hiccups that are inevitable in any large bureaucracy. The hope was that these elements of game design would help observers understand the dynamics of interaction in a real crisis, rather than relying on stylized models based on unrealistic assumptions about perfectly rational leaders in total control of their diplomatic and military services. Paul Bracken is a longtime participant in such games, and in The Second Nuclear Age he uses his experiences to draw lessons for contemporary nuclear strategy. Indeed, he believes that it is time to take gaming seriously again in order to prepare for new nuclear challenges. But the games that Bracken describes are deeply flawed and provide very little useful guidance for current strategists. The main problem is that they are lopsided. According to his account, only U.S. and allied players suffer from poor judgment and paralysis. Their adversaries somehow avoid all of the problems of bad information, psychological biases, and bureaucratic breakdowns that befuddle the United States. In one example, Bracken describes a hypothetical conflict between Israel and Hezbollah, which was supported by Iran with a small nuclear arsenal (20-30). In the game, as in previous conflicts, Hezbollah began by kidnapping an Israeli soldier or launching a terrorist attack. But unlike past cases, in this case its weapons worked with devastating effect. Bracken notes that Hezbollah’s attempt to use a cruise missile against an Israeli warship in 2006 failed because it prematurely detonated. (He leaves out the fact that Israel promptly destroyed the radars that guided the doomed missile.) Not so in the game, which assumed that Hezbollah’s missiles were “deadlier” and “killed a lot more people” (21). We must accept, without knowing why, that Hezbollah had somehow overcome the major technical hurdles involved in launching conventional attacks against a vastly superior conventional enemy. More importantly, Hezbollah’s patron Iran was a model of cunning and efficiency throughout the game. Although Iran only had a small nuclear force, “a great deal of thought had been devoted to it” because countries with “only a few weapons (are) acutely aware of how easy it might be for the enemy to knock them out.” Its planners also benefited from superior intelligence. Iranian leaders, Bracken reports, “understood the psychology of the West” and knew that it would not want to target large numbers of civilians. So Iran dispersed its missile systems and concealed some of them, while allowing U.S. and Israeli satellites to view others deployed in city parks. But even if Israel was not deterred because of its moral qualms about killing innocents, “Someone in Iran had thought through the various possible scenarios to understand that Iran needed a prompt firing deterrent, just in case Israel or the United States got any ideas about preemption” (24). This meant leaving some missiles in hardened underground silos for quick firing. The scheme represented “genuine forethought” about its nuclear force and revealed a strategy for using it that was “complex – shrewd, even” (25). Later in the game, however, Iran decided to evacuate its cities. To outside observers this might suggest that Iran’s earlier strategy to use its urban population as a gigantic human shield was unreliable, dangerous, and foolish. But to Bracken the move was “inspired.” Now Iran could credibly threaten to use its nuclear weapons – “ready to fire, on a hair trigger” – while allowing most of its population to survive a retaliatory strike. Of course, all of this rested on the assumption that the rapid evacuation of huge urban centers would take place smoothly, and that the population would go along calmly as it was “packed into buses, cars, and trucks and rode out of Tehran, Mashbad, Esfahan, out to the distant suburbs and beyond” (29). In Israel the situation was much worse: “Hundreds of thousands of Jews were mobbing the coastal marinas, desperately trying to escape to Cyprus in small boats” (29). Somehow Iran, with a much larger population, a crippling economic crisis, and massive social unrest, was able to present its enemies with a fait accompli by quietly evacuating its cities. Israel, on the other hand, was “in chaos” (29). And while Hezbollah and Iran were working in harmony, the crisis exposed huge fissures between the United States and Israel. Bracken reports that relations reached a “breaking point” under the looming threat of a nuclear-armed Iran (25). Israeli and U.S. players “spoke past each other” in the manner of “parallel play among small children” (26). The U.S. team was unsure about its moves because of insufficient prior planning and poor intelligence on Iranian capabilities (27). Its decisions made the Israeli planners “angry,” and they increasingly expressed “distrust,” “paranoia,” and a fear of “betrayal” (28). The game ended when Iran backed down in the name of world peace. Again, outsiders might view this as evidence that all of Iran’s bluster amounted to a dangerous risk with minimal return, or that Iranian leaders finally got sober once they had to face a genuine threat of nuclear attack. But the real lesson, according to Bracken, was that “Iran had used a small nuclear force to overturn Israeli deterrence and rupture the Middle East order.” Moreover, “Tehran was now empowered with a tremendous psychological victory,” and this sense of triumph would probably embolden it further in the next crisis (30). Of course, this was only possible because referees allowed participants to assume that Iran enjoyed superior intelligence, cunning strategic forethought, ruthless operational planning, flawless alliance relations, and the ability to rapidly depopulate its cities without suffering any friction. This is not plausible, and it is not helpful in understanding the shape of possible future crises. War games and simulations can be useful exercises if they inspire strategic creativity while forcing participants to be realistic, and I share Bracken’s belief that in some cases they are necessary to encourage serious thinking about force and war. But poorly structured games, or games that allow participants to indulge in utterly fantastical beliefs about adversary capabilities, are not useful. If anything, they encourage threat inflation about other nuclear powers while devaluing the deterrent value of one’s one nuclear arsenal. A second problem with the book has to do with its discussion of the utility of nuclear weapons. Bracken sets out to convince readers that nuclear weapons matter, despite the fact that they have not been used in war since 1945. “You don’t have to fire a nuclear weapon to use it,” he declares, and sets out to prove that nuclear weapons are important for deterrence, coercion, communication, bargaining, and alliance relations (60). Moreover, the United States was able to save money by relying on relatively inexpensive nuclear weapons while forcing the Soviet Union to overspend on its own conventional defense. Bracken correctly notes that U.S. officials sought to use nuclear weapons for all of these purposes. On numerous occasions they used subtle nuclear threats to try to influence Moscow, while also using nuclear rhetoric to reassure allies that Washington would fight on their behalf in order to convince them that they did not require an independent nuclear arsenal. None of this is controversial. The crucial question is not whether the U.S. acted, which is already clear, but how Moscow reacted. If current strategists want to use history as a guide for nuclear threats against today’s adversaries, then they need to know whether Soviet officials understood U.S. signals and whether they changed their behavior in response. Unfortunately we learn almost nothing about this from The Second Nuclear Age. Bracken goes into some detail about some of the ways in which U.S. leaders tried to translate nuclear weapons into political leverage, but readers have no way of assessing whether these actions were successful or even necessary. At best the book shows that nuclear weapons were used. It does not show that they were useful. Take the discussion of President Harry S. Truman’s actions during the Berlin Airlift (50-58). According to Bracken, the pattern of nuclear signals during 1948 was a “game changer” because it allowed Truman to raise the level of risk and compel the Soviet Union to end the blockade of the city. Absent nuclear weapons, the United States would have had few plausible options (52-53). Bracken praises Truman for moving nuclear forces forward in order to create uncertainty in Moscow, while simultaneously choreographing a show of political unity at home and contriving way to end the crisis that allowed Stalin to save face (55-57). But how did Moscow actually respond to the movement of U.S. bombers? And was it ultimately compelled to stand down because it feared that U.S. actions were increasing the risk of a nuclear attack? If this was the case, then Bracken can make a powerful argument about the strategic utility of nuclear weapons and the need for serious thinking about how to design effective nuclear signals. On the other hand, it may be that U.S. threats were so ambiguous that they were not received in Moscow, or that Soviet leaders were motivated by issues that were unrelated to nuclear weapons. If so, then Bracken’s conclusions are either wrong or irrelevant. Bracken assures readers that U.S. moves had the desired effects, but he does not really make the case. After U.S. bombers began shuttling from base to base, “Moscow was kept guessing about what might come next, and where. And the Soviets didn’t like it one bit” (55). Later, in response to the Truman administration’s military and political efforts, the Soviets “did try some pathetic countermeasures,” including a live-fire exercise in their occupation zone (56). Bracken provides no evidence that Soviet leaders were thinking about U.S. weapons, however, and the sources he provides are of no help. Three of the four sources he cites make little or no attempt to explore the causes of Soviet behavior or the relationship between U.S. nuclear signals and Soviet responses. The one exception is a RAND study by W. Phillips Davison originally published in 1957, which necessarily suffered from lack of access to Kremlin records and had to make educated guesses about Soviet beliefs. Moreover, Davison’s conclusions about Moscow decision-making cut in both directions. He argues that moving B-29s to Europe “represented an increase in the immediate retaliatory power of the West, which the Soviets would have to take into account if they contemplated any new and bolder moves.” On the other hand, Davison argued that they probably knew that Paris and London would restrain the United States, and that U.S. leaders were reluctant to use nuclear weapons against Soviet cities because that would justify a rapid conventional offensive. European and American concerns chipped away at the credibility their nuclear warnings. While Soviet leaders might have been more cautious under the shadow of nuclear weapons, it is not clear that any additional U.S. posturing influenced their judgment. Davison had no choice but to deduce Soviet motives, given the poverty or resources at his disposal. Not so for Bracken, who should be able to benefit from a large and growing historiography on Soviet decisions during the Cold War. Some of the most important works suggest that Stalin was not focused on nuclear threats during the crisis. Instead, he operated according to misguided beliefs about German politics, German relations with the United States, and the durability of capitalist economies. He was ultimately forced to confront these misperceptions after witnessing the stubbornness of the German people, the ingenuity of the airlift, and the success of currency reforms in the western zone. Truman’s opaque nuclear moves may not have played much role at all. None of this is to argue that U.S. thinking on nuclear weapons is uninteresting or unimportant, and some of Bracken’s anecdotes provide an interesting window into Washington in the 1970s and 1980s. But Bracken has not simply written a history of U.S. decision-making. He is interested in strategy, or the ways in which states use military forces to achieve political goals. He aims to inspire a broad discussion of the use of nuclear weapons, past and present, in order to re-energize strategic thinking in the U.S. national security establishment and help officials better prepare for future crises. Strategy is inherently interactive, however, meaning that efforts to draw strategic lessons from past cases require a serious analysis of how adversaries responded to one another. The Second Nuclear Age does not provide this kind of analysis. In 1942 Bernard Brodie wrote a book called A Layman’s Guide to Naval Strategy. He deliberately sought to overcome the myth that “strategy can be comprehensible only to people who wear uniforms,” and argued that a national discussion was vital for a democracy in war. Bracken also appeals to a wide audience, avoiding jargon, writing bluntly, and using colorful metaphors to illustrate key concepts. And like Brodie, he believes that a broad discussion of nuclear matters is critical for national security. Breaking the government’s monopoly on the conversation, as he puts it, is important because it forces officials to consider political and moral issues rather than simply indulging in technical and operational problems. Bracken is “convinced that this lowered the risk of nuclear war” in the last century, and believes that another national conversation about is badly needed today (12). Unfortunately, The Second Nuclear Age does not succeed as a layman’s guide to nuclear strategy. It is more likely to lead the layman astray. Its one-sided treatment of historical cases may cause readers to overestimate the value of nuclear coercion during the Cold War, when the reality was always messy and the effectiveness of signals was seldom clear. And its one-sided description of war games, in which the United States suffers from political, psychological, and bureaucratic maladies but its adversaries do not, may cause readers to inflate threats and overreact in the event of a crisis. Rather than gaining a better understanding of nuclear strategy, readers will leave with a rose-colored view of the past and a fearful view of the future, neither of which is accurate. See generally S. Paul Kapur, Dangerous Deterrent: Nuclear Weapons Proliferation and Conflict in South Asia (Stanford: Stanford University Press, 2007). Bracken cites Curtis S. Signorino and Ahmer Tarar, “A Unified Theory and Test of Extended Immediate Deterrence,” American Journal of Political Science, Vol. 50, No. 3 (July 2006), 586-605; Ari Shalom, The United States and the Berlin Blockade 1948-1949: A Study in Crisis Decision Making (Berkeley, CA: University of California Press, 1983); and A.M. Giangreco and Robert E. Griffin, Airbridge to Berlin: The Berlin Crisis of 1948, Its Origins and Aftermath (Novato, CA: Presidio Press, 1988). Sigorino and Tarar argue that the crisis supports their formal model of extended deterrence, but they treat the case very briefly at the end of their article and provide no historical support for their argument. Shalom is almost entirely focused on the United States, and Giangreco and Griffin only mention nuclear weapons on one page. W. Phillips Davison, The Berlin Blockade: A Study in Cold War Politics (Princeton, NJ: Princeton University Press, 1958), 156-157. Bracken cites a 1980s reprint of the original RAND study. See especially Vladislav M. Zubok, A Failed Empire: The Soviet Union in the Cold War from Stalin to Gorbachev (Chapel Hill, NC: University of North Carolina Press, 2007), 74-78. On the ambiguity of Truman’s threats, see Richard K. Betts, Nuclear Blackmail and Nuclear Balance (Washington, DC: Brookings, 1987), 27-29. For similar conclusions about the nature of the threat and the mixed Soviet response, see Gregg Herken, The Winning Weapon: The Atomic Bomb in the Cold War, 1945-1950 (New York, NY: Knopf, 1980), 262; John Lewis Gaddis, We Know Now: Rethinking Cold War History (Oxford, UK: Oxford University Press, 1997), 91-92 and 98; and David Holloway, Stalin and the Bomb: The Soviet Union and Atomic Energy, 1939-1954 (New Haven: Yale University Press, 1994), 272. Bernard Brodie, A Layman’s Guide to Naval Strategy (Princeton, NJ: Princeton University Press, 1942), vii-ix.